Denis O'Hare is a award-winning actor on both the screen and the stage. O'Hare won a Tony Award for Best Performance by a Featured Actor in a Play for his performance in Richard Greenberg's Take Me Out, where his character's lengthy monologues in which he slowly falls in love with the game of baseball were considered the main reason for his award. He won the 2005 Drama Desk Award for Outstanding Featured Actor in a Musical for his role as Oscar Lindquist in the Broadway revival of Sweet Charity. In 2003 O'Hare played a doctor in 21 Grams. In 2004, he played Charles J. Guiteau in the Broadway production of Stephen Sondheim's Assassins, for which he was nominated for the Best Performance by a Featured Actor in a Musical Tony Award. Before appearing in those shows, he appeared on Broadway in the 1998 revival of Cabaret, in which he played Ernst Ludwig onstage and the clarinet in the show's orchestra, the Kit Kat Band. O'Hare was featured in the Hallmark Hall of Fame presentation of Saint Maybe. He has appeared as a guest star on several episodes of Law & Order and its spin-offs, Law & Order: Special Victims Unit and Law & Order: Criminal Intent. In 2008, he appeared as a guest star on several episodes of Brothers & Sisters. His feature film credits include The Anniversary Party, 21 Grams, Garden State, Derailed, Michael Clayton, A Mighty Heart, Half Nelson, Milk, Edge of Darkness, Charlie Wilson's War, and Changeling. In 2009, O'Hare portrayed Phillip Steele (an amalgam character based on Quentin Crisp's friends Phillip Ward and Tom Steele) in a television biopic on Crisp entitled An Englishman in New York. The same year he played therapist Dr. David Worth in the series Bored to Death. In 2010, O'Hare joined the cast of HBO's True Blood in its third season as Russell Edgington, the vampire king of Mississippi who is 2,800 years old. In 2011, he appeared in the film The Eagle as a Roman officer named Lutorius. Recently he has appeared in a recurring role as Judge Charles Abernathy on the television drama series The Good Wife. O'Hare also co-starred as Larry Harvey in FX's first season of American Horror Story, Murder House. In 2012, O'Hare starred alongside Amy Adams and Donna Murphy as the Baker in Stephen Sondheim's Into the Woods at The Public Theater. The production played at the Delacorte Theatre in Central Park, NYC, from July 23 to September 1, 2012. 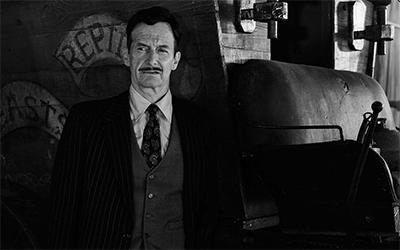 In 2013, O'Hare returned to American Horror Story for its third season, American Horror Story: Coven, where he portrayed Spalding, the house butler. O'Hare portrayed con artist, Stanley on the fourth season of the series, American Horror Story: Freak Show. In 2015, O'Hare played a hotel worker, Liz Taylor on the fifth season of the series, American Horror Story: Hotel, and in 2016 he was Dr. Elias Cunningham on the sixth season, American Horror Story: Roanoke.